A 12-year-old juvenile in his windowless cell at Harrison County Juvenile Detention Center in Biloxi, Mississippi, operated by Mississippi Security Services, a private company. There is currently a lawsuit against MSS that forced it to reduce the center’s population. An 8:1 inmate to staff ratio must now be maintained. 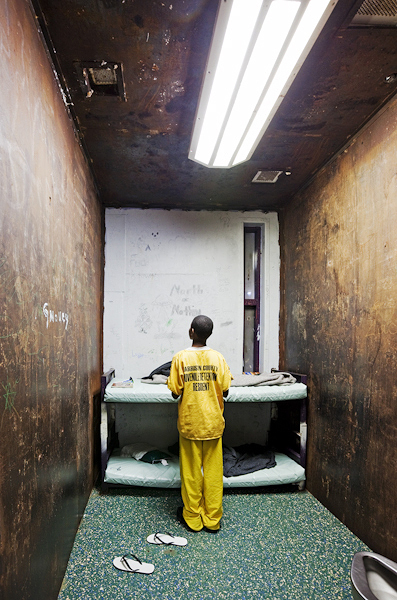 Photographer Richard Ross captures what life is like behind bars for juveniles. You should check out his photography. His photos are both haunting and revealing about the lives of incarcerated juveniles. ← What are the odds you will go to prison?